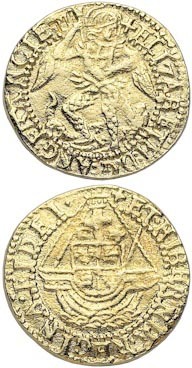 A reproduction Elizabeth I Quarter Angel coin with St. Michael and a dragon on the obverse and a ship bearing a shield on the reverse. You'll receive 5 reproduction Quarter Angels in a single order. Gold-plated pewter. Made in the United Kingdom.